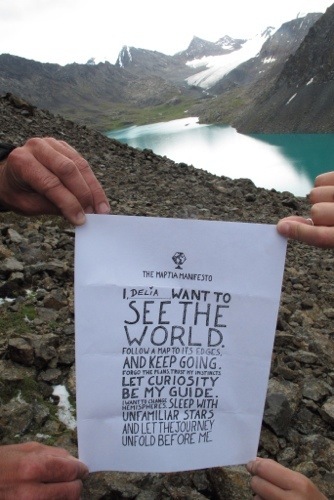 I want to see the world. Follow a map to its edges, and keep going. Forgo the plans. Trust my instincts. Let curiosity be my guide. I want to change hemispheres. Sleep with unfamiliar stars and let the journey unfold before me. I do, I really do. Although I started to question it as the thunder clouds rolled in, I challenged it as the lightning illuminated the sky and then, when we realised we had lost our way up the mountain, I wanted to rip up the map and go back home for a cup of tea. 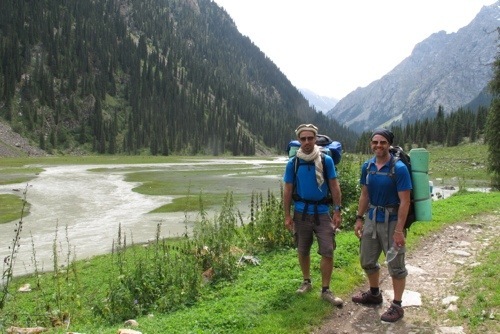 You see I was taking part in what turned out to be the most gruelling 48 hour trek of my life – to the high altitude lake of Ala-Kol in Kyrgyzstan. And, carefully folded up in a waterproof folder in the depth of my soaking wet bag, was a single sheet of A4 paper that carried a pledge with the words above written on it. It is the manifesto of Maptia, a new organisation which plans to help people create their own personal maps of the world, and as soon as I saw it I knew I had to sign it. And, by a rather strange coincidence, I used to wait on tables with one of the founders of the group… almost proof that the world is small and I can follow it to its edges. 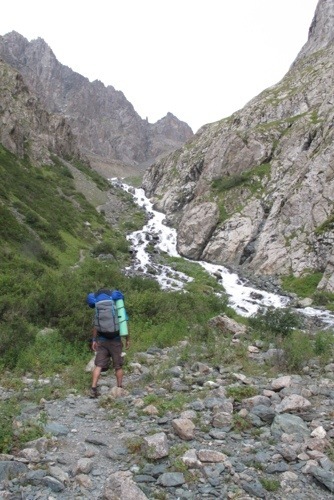 So, off we set on our two day trek from Karakol in Kyrgyzstan to lake Ala-Kol, equipped with a hired tent, roll mats, sleeping bags and everything. The sun was shining. And the boys carried a few bits too. We strolled along a raging river, surrounded by lush green hills dotted with horses and cows, and after about four hours or so, stopped for a tuna, cheese, bread and biscuit lunch that we felt quite proud of. Wiping the crumbs from our mouths, we set off again (with Matty’s bag two whole tuna-tins lighter). It was here we began the ascent. Over the two days we were to climb (and then drop) 2,000 metres, reaching a maximum altitude of 3,900 metres. Inevitably the higher we climbed, the shorter of breath we became. I staged plenty of: “Wow, look at this scenery,” stops so I could catch my breath. And it was pretty spectacular. 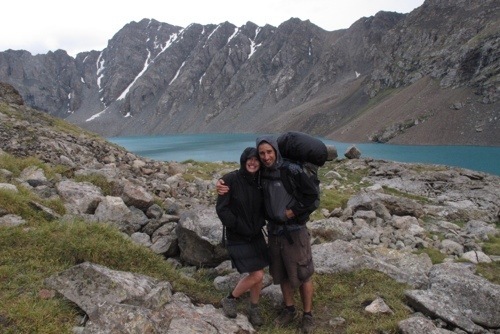 But it was after about seven hours of trekking (three hours of climbing), when we were on the side of a bare, rocky mountain, that the drizzle started. At first it was just a smattering of inoffensive rain drops, not worth shaking an umbrella at, but they soon started to fall harder and faster. Lunch felt a long time away, Matty’s feet had begun to resemble something of a dead person’s (take note: bring waterproof shoes for this trekking malarkey), and as the temperature dropped dramatically, I lost all sensation in my fingers. We looked up to the rocks above us that we still had to climb, blinking away the freezing raindrops from our eyelashes. I put my white fingers under my armpits in a desperate attempt to warm them up, and even The Mongoose (aka Mountain Boy) seemed to jump from rock to rock with less enthusiasm. I’m not sure what came first, the huge clap of thunder or the four small words from the Mongoose’s mouth: “We’ve lost the track.” Both filled me with an immense sense of dread and a strong urge to cry. The rain turned into hail and as I pulled the hood of my jacket over my head tighter to shield my face from the hard pellets of ice falling from the sky, Mongoose ran up a few different rocks in a bid to find some red painted stones that might indicate we were back on track. He would return to us, shake his head and try another route. Headlines ran through my head. None of them were good. I tried to focus my efforts on warming my hands up instead. The Mongoose was standing at the base of a steep, gravelly route up the mountain with solid rock to his right that he was gripping onto. We still had a way to go. An hour to be precise – although I didn’t know it at that point. I gave my hands one last rub and began the steep ascent to the sound and light show of the Gods above us, muttering darkly under my breath. I don’t remember the detail. Only that my feet went numb, the peak felt endless, the thunder got louder and the rain got heavier. 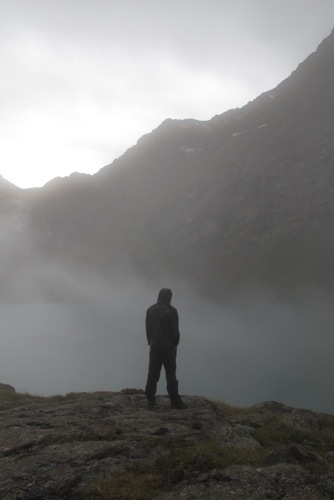 And then suddenly I had reached the top and the lake came into view. And the rain stopped. And it stopped long enough for us to take this picture, get our tent up, and get dinner going on the stove. 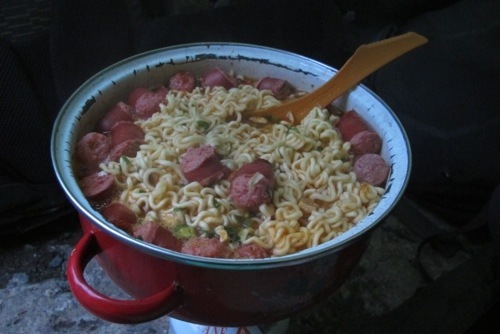 These chilli super noodles tasted better than anything I’ve had in a long time. Yes, we even chopped up frankfurters for a bit of protein. Get us. And as we layered up in our remaining dry clothes and huddled in the huge (and now slightly wet) goose down sleeping bags we’d* hauled up the hill, the rain and thunder began again. Our tent was one of those odd ones where the metal roads are on the outside of the canvas, making for a perfect lightning conductor. While we slept the rain fell heavily and the wind blew furiously – but somehow, in the morning we were all still there. But so was the rain. We woke to a fearsome storm that appeared to have got angrier as the night progressed. So we sat in our little tent, waiting for it to pass. By this stage I had written the entire front page of our tragic demise. The boys handed me my Kindle and told me to be quiet. They ventured out to inspect the situation when the rain quietened. There is a lake beyond that mist I promise. Eventually at about 10.30am we made a run for it. 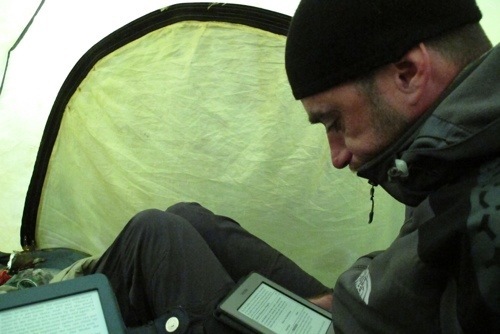 The rain had eased a little so I strapped socks to my hands and with an air of (perhaps dampened) determination we left the comfort of the tent. 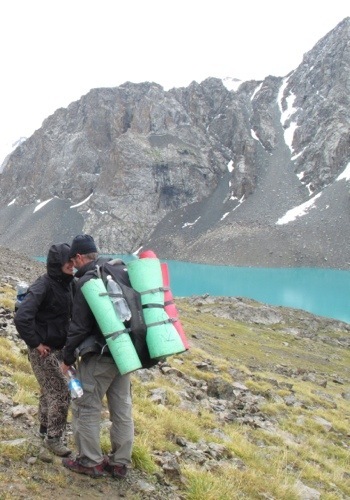 We had our final climb of the trek to complete from 3,500 metres (the height of the lake) to 3,900 metres across the lake and over the mountain behind it – before beginning a long descent. (Me and Matty having a morning pep talk). Then, just as we turned a corner, which revealed the rest of the previously hidden lake, the sun came out. 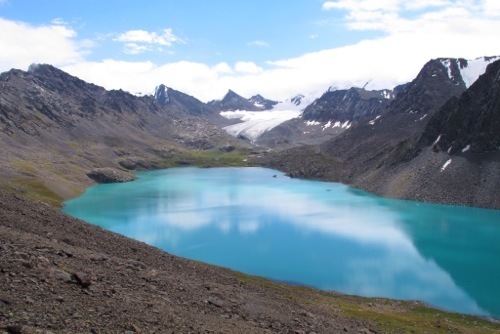 And as it shone down on the lake below us, illuminating the icy glacier behind it, it was as if it also opened my eyes for the first time since the rain had begun. It was stunning, it was beautiful, it was so isolated and rugged and I was incredibly privileged to see it. The Mongoose turned around and grinned. “Nobody said it was going to be easy,” he said with a wink. No, travelling a map to its edges is not meant to be easy, I thought as I unfolded my Maptia manifesto. But it’s going to be beautiful. *That isn’t really my bag, that’s Matty’s (although it does contain a lot of my stuff). 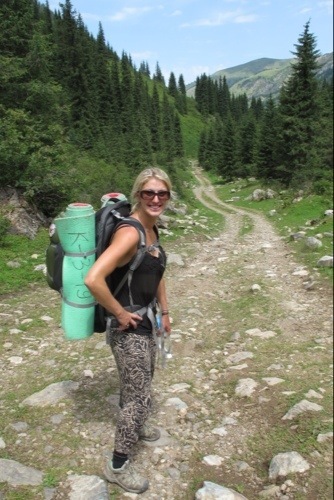 I might have carried a 7kg day pack instead… for reasons discussed here. Oh, and for the record (because this blog speaks only the truth), Clinique moisturiser is an essential trekking item. 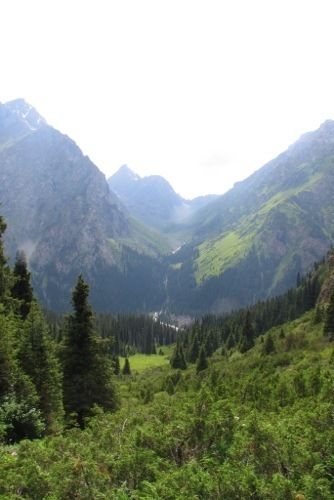 This entry was posted in Kyrgyzstan, Recent Posts and tagged Hiking, The Silk Road by Delia. Bookmark the permalink. Wow, so much greener than I would have assumed the ‘stans are. Also, that lake looks like Tongariro in New Zealand. Do you know what Kristin, this whole country reminds me of New Zealand – perhaps 50 years ago or something. It is the only green stan – the rest enjoy more shades of brown! I am so in awe of you both. What an adventure! So much respect for your nerve and just getting out there and doing it. See you eventually, until then keep safe. Love Di Glover.